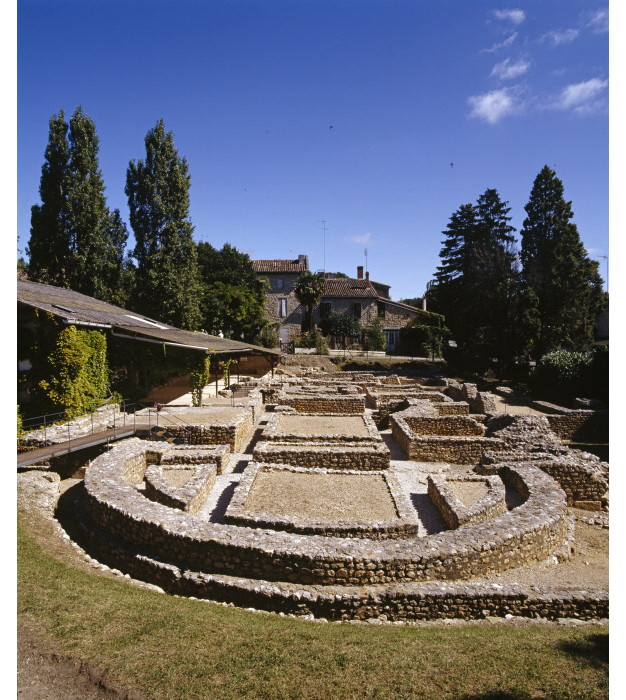 The Montcaret Archaeological Site is located in a village surrounded by vines, on the borders of the Périgord and Bordeaux regions. The site features a Gallo-Roman villa (rural aristocratic residence) and private baths, with stunning mosaic floor tiling. Visit the Montcaret Archaeological Site. - A wealthy aristocratic residence. The site features the remains of a cross-shaped dining room (triclinium), which is now housed in a protected museum space, as well as vast 350 m² reception hall and private baths. - A variety of mosaic floor tiles. The frigidarium (cold bath) features a stunning mosaic piece consisting of 16 square panels, 13 of which are perfectly preserved. These panels depict scenes of the sea (fish and shellfish). The mosaic tiles in the other rooms are decorated with geometric shapes and plant patterns.